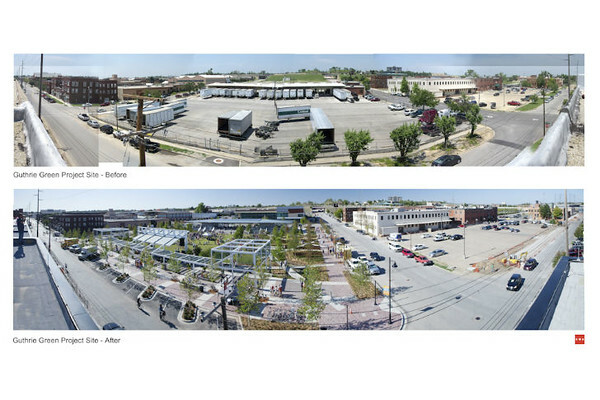 The George Kaiser Family Foundation shares the story of Guthrie Green: an amazing transformation of a contaminated truck loading facility in downtown Tulsa, Oklahoma into a vibrant urban park that showcases the best of modern-day “green” technology. Downtown Tulsa, Oklahoma is infamous within urban planning circles for winning (or more correctly losing) the Golden Crater award in the 2013 Streetsblog Parking Madness competition. 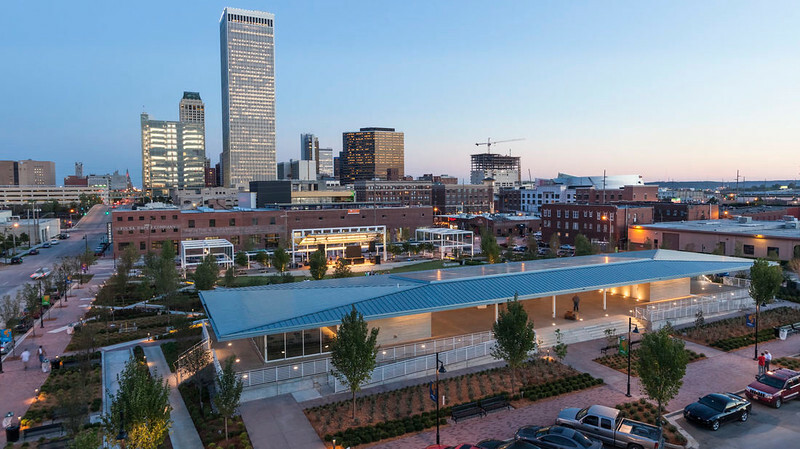 But Tulsa has quietly and steadily improved over the past decade, and much of that improvement has occurred along the urban edge of downtown through popular downtown districts like the Blue Dome and East Village Districts. Perhaps no other symbol defines Tulsa’s emerging urban journey than Guthrie Park. Built and managed by the George Kaiser Family Foundation (GKFF), the park has become the area’s leading destination since its 2012 opening. Roughly 3,000 people use the park each week, drawn by a diverse range of daily programming. 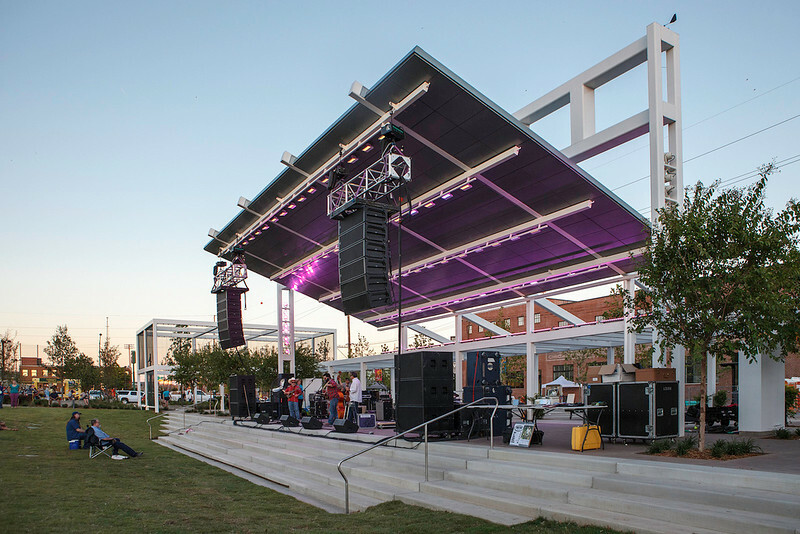 The success of the park has sparked $150 million investment in a variety of public, commercial, and residential projects within the emerging 19-block Brady Arts District of downtown Tulsa. 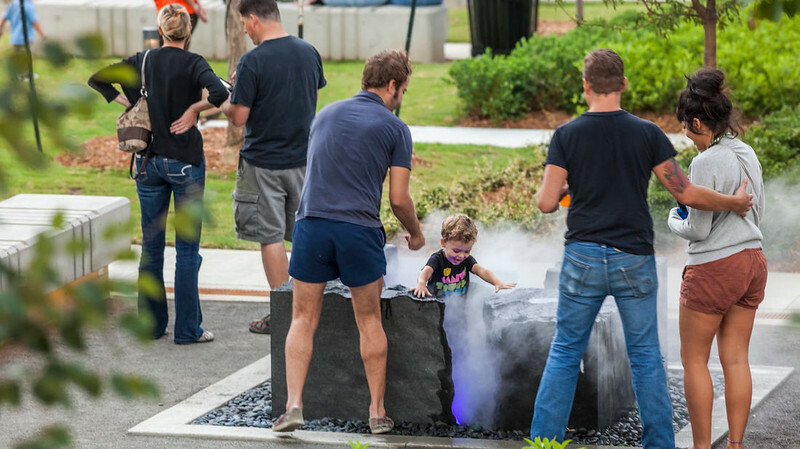 Year-round park features include “Food Truck Wednesdays” that regularly attract around 500 people, the all-season café pavilion, and special events to coincide with “First Friday Art Crawls,” when art and exhibit venues throughout the Brady Arts District are open to visitors. This winter also saw special café-sponsored “Snow Days” gatherings and “Picker’s Circles” where local musicians gathered to play on warm winter days. 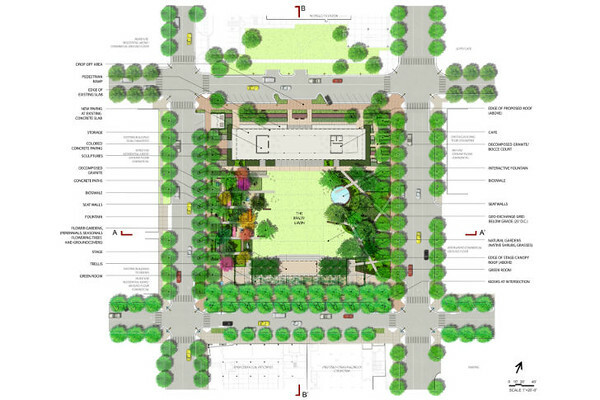 On a more informal basis, Guthrie Green is popular as a lunch place for downtown workers and as a play spot for newly arrived city-dwelling families. Park activities rev up from Memorial Day through October with daily tai chi, yoga, and fitness classes offered through the Downtown Y; a produce and flea market on Sundays; a Thursday night movie series; and weekend musical concerts of all sorts. Regular art classes and exhibits round out the calendar year. This June the park also served as a major venue for Saint Francis Tulsa Tough, a premier three-day cycling festival that seeks to elevate the profile of Tulsa and promote active lifestyles.